Iron is normally stored in the reticuloendothelial system and the hepatocyte. The total body iron varies with age and gender. The total body iron content of neonates born to mothers without iron deficiency has been estimated to be 75mg/kg. About 60% of this is acquired in the third trimester. Neonates born to iron deficient mothers have lower iron stores. A fall in iron stores is evident when the haemoglobin falls below 8.5g/dL and the depletion becomes more severe below maternal haemoglobins of 6.0g/dL. The rapid growth between birth and adolescence needs expansion in blood volume. The iron supply remains precarious for most of this period and children frequently run the risk of developing iron deficiency. Children born to iron deficient mothers are at a higher risk of iron deficiency. Women: Premenopausal women have lower iron store than men because of iron loss associated with menstruation and pregnancy. The normal iron content is women 35mg/kg. The iron content gradually rises after menopause. 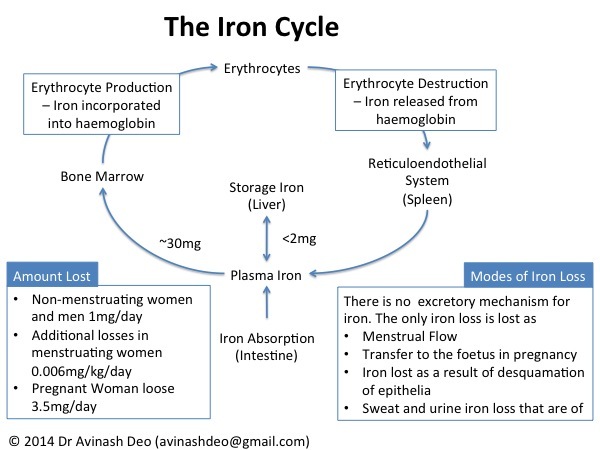 Normal erythropoiesis needs 25mg of iron about 1-2mg comes from absorption and the rest from macrophage iron recycling. Macrophage iron recycling is an important source of iron for haematopoiesis and as discussed later, more sensitive to hepcidin. Storage compartment: Ferritin and Hemosiderin have about one fourth of the body iron. About half the storage compartment is ferritin and half hemosiderin. Ferritin iron is more readily available. Transport compartment: Plasma contains a small fraction of the body iron stores. Plasma iron is bound to transferrin. Non-transferrin bound iron is toxic and seen in states of iron overload when the iron binding capacity of transferrin is exceeded. Though this compartment is small it is turned over six to eight times a day.